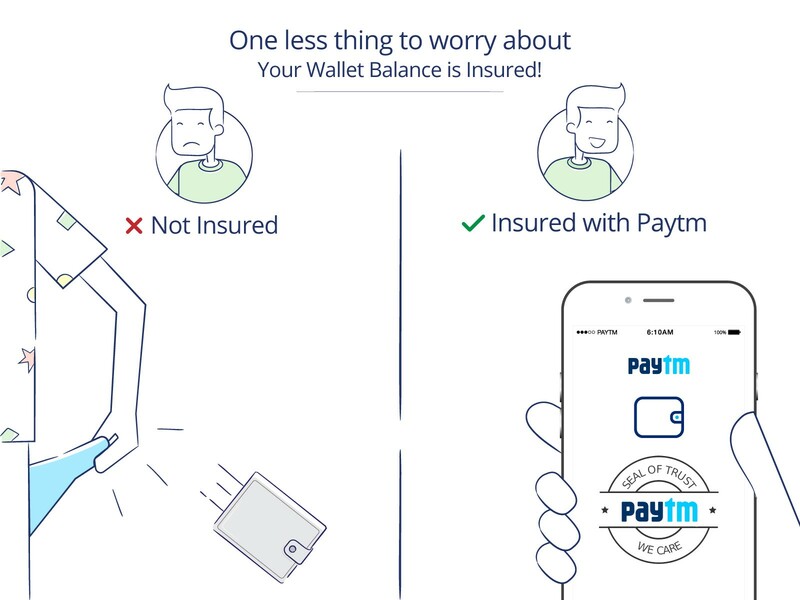 Introducing Paytm’s new Wallet Insurance — an insurance cover to safeguard the money in your Paytm Wallet in the unfortunate event of theft, loss of device or unauthorized access of their Paytm Wallets. 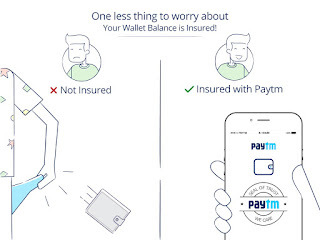 All Paytm users with balance in their wallets would be automatically covered under this scheme at no additional cost and the lost money would be refunded to their Paytm Wallets. All you need to do is report the loss immediately to us at paytm.com/care or by calling our Customer Care number +91 9643 979797, and then lodge an FIR about loss of device (in case of loss/theft of device) and share the details with us. That means, in addition to being faster and way more convenient than cash, you also have the additional peace of mind provided by an insurance cover. Loss of Paytm Wallet balance up to Rs. 20,000 due to fraudulent transactions as a result of theft, burglary or loss of mobile phone/device.Loss of Paytm Wallet balance by unauthorized fraudulent transactions if the user’s log in credentials weren’t shared. 1) Report the loss or theft to us at paytm.com/care or by calling our Customer Care number +91 9643 979797 within 12 hours. 3) We will block your Paytm Wallet post the incident being reported and appropriately validated. 1) Report the loss to us at paytm.com/care or by calling our Customer Care number +91 9643 979797 within 12 hours. Please give details of the fraudulent transaction. 2) We will block your Paytm Wallet post the incident being reported and appropriately validated. I forgot to report my loss within 12 hours. Would I still be eligible for the insurance money? Coverage will be applicable only in case of Paytm receiving intimation of any transaction/loss of device within 12 hrs of the incident. 2. What is the coverage amount? The reimbursement amount will be a maximum of the user’s Paytm Wallet balance at the time of incident or Rs.20,000, whichever is lower. 3. What if I have lost phone multiple times this year? Only one incident of claim is applicable per user within a period of 12 months. 4. How will the insurance amount be settled? The claim will be settled in your Paytm wallet after you confirm that you now have access to your Paytm account and that your account password has been changed. 5. Can I log into my Paytm Wallet from another wallet if I lost my phone? Paytm will block the wallet post the incident being reported and appropriately validated. You can only use your Paytm Wallet after we unblock your account and offer you a new password. 6. What are the events not covered under this scheme? Any loss occurring in case the user details/device were shared/misplaced/acquired due to user’s negligence.Any fraud due to misuse of credit card/debit card/bank account information through the Paytm Platform.Any loss arising out of negligence on the part of the user (e.g. typing a wrong number to send money).Any loss arising due to user not upgrading/adopting the latest security features released by Paytm.